Your kiddos will gobble-up these seven math centers. This pack includes directions, pieces, and recording sheets for each activity. 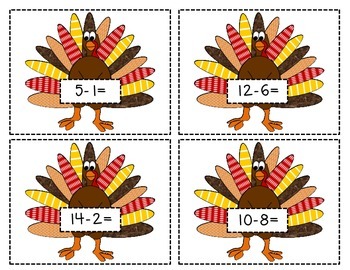 *Gobble-Gobble Odd & Even Sort: Take turkey numeral cards and sort onto the odd or even mat. *Gobble Equation Sort: Solve the addition and subtraction turkey equations and sort onto an odd or even mat by answer. 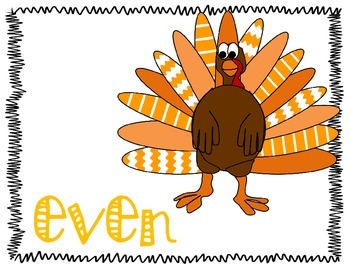 *Turkey Place Value: Match the expanded notation turkey body to the numeral feathers. 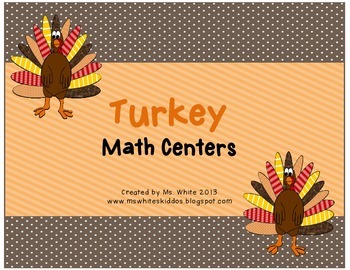 *Building Turkey Place Value: Using the turkey expanded notation cards build the number on the place value mat with turkeys. *Turkey Equations: Find the missing numeral to make the equation true by placing a numbered turkey into the equation. *Turkey Graphing: Grab a handful of colored turkeys and graph. Answer questions based on the graph. *Turkey Fraction Memory: Flip over two cards to see if fractions match. You can also purchase the accompanying Literacy Centers in my store. Enjoy!